The LA4’s main frontal attraction is not its teeny-tiny power button, or the small rotary volume control knob; it’s the capacitive touch screen. Audio options like channel balance and input gain boost / cut are controlled directly from the screen, as are other setup options, like input naming, and screen dimming. The screen uses graphics that are easily recognized from the listening chair. There is a vertical progress bar that shows volume level, and a mute “button” that turns red when engaged. An alternate to mute is -20 dB. It lowers volume by, guess what? -20 dB! When this option is on the progress bar lowers by -20 dB from the current volume setting, and turns yellow for quick identification. Less often used options that are not duplicated on the remote must be accessed from the touch screen. All features are easy to understand and simple to adjust, but just in case, there is a help button too! 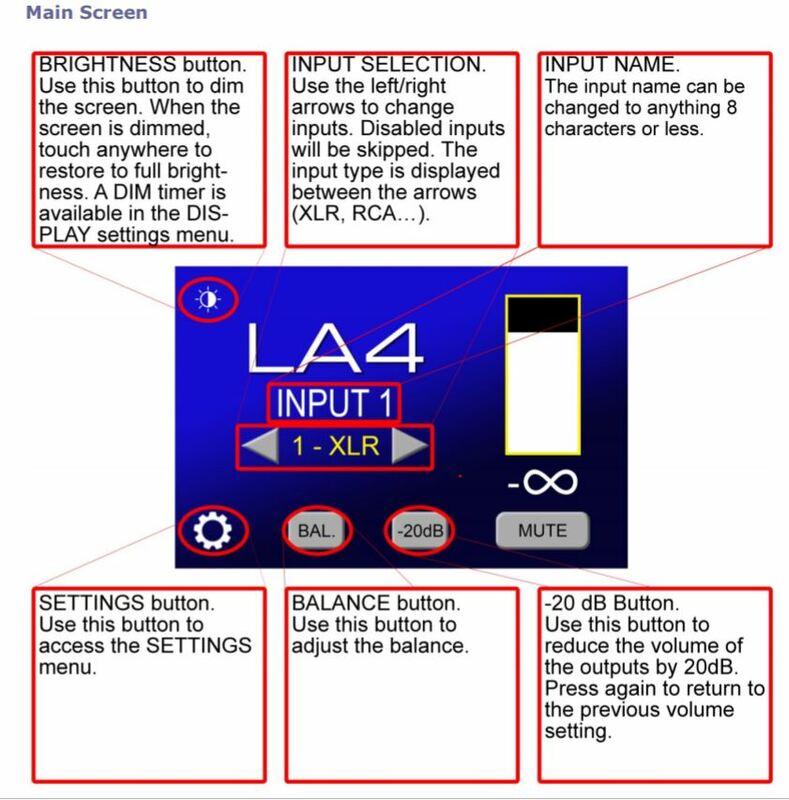 Above is an example of the LA4’s Touch Screen Operation as shown in the Benchmark Operation Manual. Being such a diminutive component, the rear of the LA4 is a very busy place. Benchmark manages to useably cram: an IEC power inlet, (2) 12V bidirectional trigger ports, (2) balanced XLR line inputs, (2) unbalanced RCA line inputs, (1) balanced XLR line output, and (1) unbalanced RCA line output. Oh, and one balanced mono sum line output too. Whew! Yes, the rear is a very busy place, but it is smartly laid out, and all connections are easily accessed. I’ve found that stepped volume controls often fail to offer enough steps to ensure sufficient control, especially at lower volumes. The LA4’s fully-balanced relay gain control takes care of that by providing two hundred and fifty six (!) steps in 0.5 dB increments. That makes dialing in the perfect volume level a breeze. Duh. The optical rotary control dial on the front features an accelerator that will cycle quickly through those 256 steps. A simple push of the dial will wake the LA4 if the auto-dim or sleep function has been enabled. 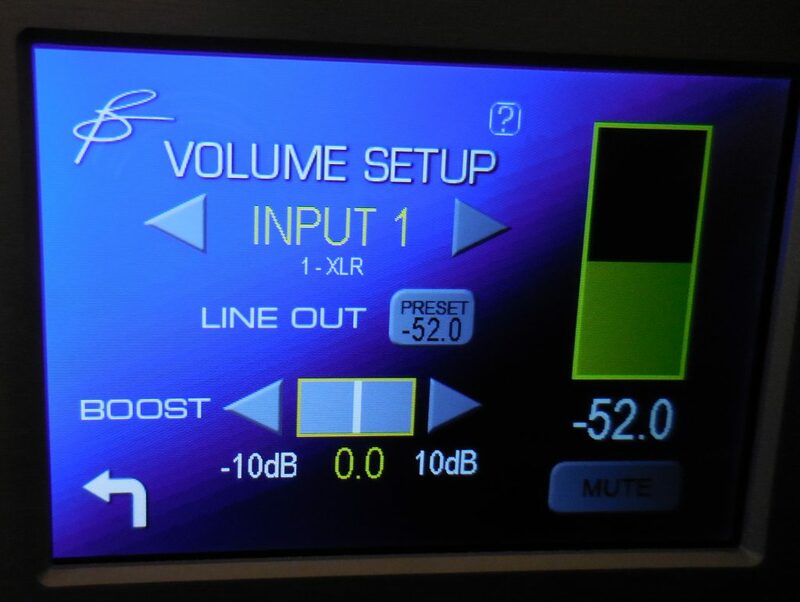 I liked the option to adjust individual input gain by boosting or cutting the dB output up to 10 dB. It allowed me to match input levels between my digital, and analog sources. The gain / boost can also be used to correct level differences between pro and consumer level cables. Benchmark has designed the LA4 to perform best with professional level balanced XLR cables (+24 dBu at 0 dBFS), and recommends them for optimal performance. For a detailed explanation of the Benchmark fully-balanced relay gain control, go to the Benchmark website HERE. For twenty years I’ve bounced around with preamps. I’ve enjoyed the transparent wonders of passive, and the simple directness of DACs with built-in volume controls, but I’ve always come full circle back to active preamplification. There’s no mystery to it, I just like active better—as long as the noise floor is low. And to these ears, the LA4 has a noise floor that is not just low, it’s bats-strain-to-hear-it low. I am not a spec-geek, but striving for outstanding specifications when designing audio components is doubtless a praiseworthy goal. The LA4’s specifications are unquestionably excellent. When using pro-level balanced interconnects, the LA4 manages a Signal to Noise Ratio (SNR) greater than 135 dB, and Total Harmonic Distortion (THD) of -125 dB (which is the equivalent of a decimal followed by a whole bunch of zeros with a number six at the end). The bats are being fitted with hearing aids. Specifications and operational features are obviously important, but mission critical to me is how the LA4 sounds. My initial impression was simple: The LA4 preamp plays everything that is, and nothing that isn’t…Neutrality in Audio… and that’s really all this review needs to convey. Benchmark Media Systems doesn’t hold back. They want you to know what you are buying. It’s almost a must to read the manual. I won’t even attempt to paraphrase all the important information it contains. Check out their website too (HERE). The exhaustive amount of technical information (most, if not all, written by Benchmark’s Director of Engineering, John Siau) that accompanies their product designs is as informative as it is impressive. In the About Us section of the website, Benchmark discusses their design goal of absolute sonic neutrality and transparency. They state clearly without wavering: their products may not be for everybody. I would expect for mastering engineers, non-interventionist transparency is a huge positive. Whether it is a good thing for audiophiles is a matter of personal taste. In general, I would agree the LA4 may not always sound pretty, especially with extremely sibilant, highly compressed, or poorly recorded music. But the flip side of this honest translucency is the LA4’s ability to highlight an amazing recording within its neutral electronic borders. Note: Benchmark does not include Swiss chocolate with the LA4. Not even a Hershey bar, dang it. Also note: It was my experience that the LA4 did not sound its best out of the box, requiring at least a couple weeks of play to open up, smooth out, and walk the bass down the stairs to the basement. The moral: don’t rush to judgement. The LA4 (and AHB2 as well) require break-in. The LA4 preamp may occupy neutral audio country, but it is a sweet piece of audio kit. I love its form-factor. I love its simple operation. And I love that it allows the sound of the signal to flow through to the downstream components. This means, of course, you’d better like the sound of your DAC or analog rig, because that is basically what you are hearing on the other side of the border crossing. 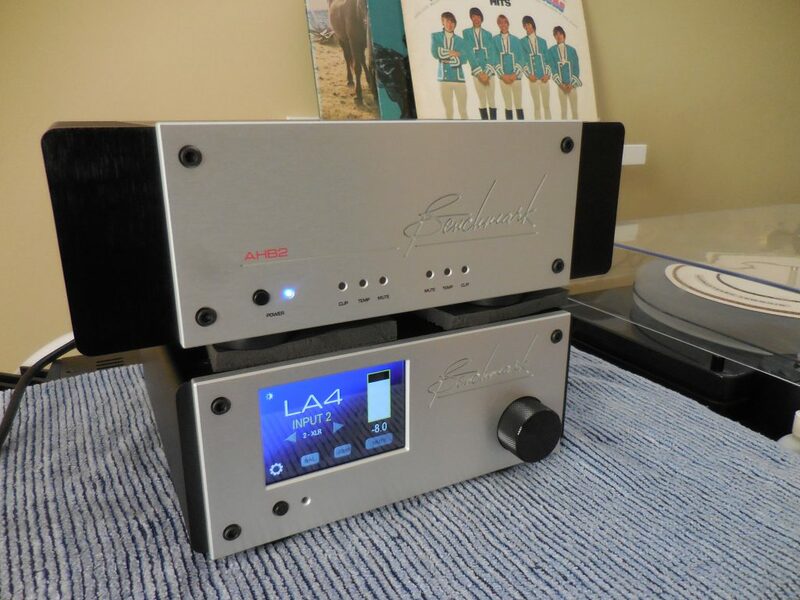 While the LA4 doesn’t seem to have a sound of its own, it does the high-end audio doodahs very well. It’s fast. It has exceptional transparency and resolution, and adds a measure of slam and dynamic contrast. I hear excellent bass performance, and one of the best sound stages I’ve heard in my system. My hearing is not what it once was, nor is it tolerant of long sessions of high decibel playback. The L4A and its incredible vanishing noise floor makes it way too easy to turn up to ear bleed levels. I even kept a smartphone app handy to check that I wasn’t thumping my ear drums to death. Stridency can make an unwelcome appearance at very high volumes, but listening loudly with a preamp this clean is quite a thrilling experience. One of things I look for when reviewing any component, is how well it reproduces music at lower volumes. Cranking tunes to high volume peaks is an exhilarating torture-test, but it can break an audio system’s spirit (a nice way to say it can sound like crap). It can be equally tough for gear to maintain sonic decorum when turned well down. The LA4 scales downward beautifully, maintaining a nice sonic balance. No matter the volume, the LA4 delivers a cavernously wide stage, startling dynamics, soaring treble, excellent timbre, and satisfyingly deep bass. It peels away the haze from each layer of music, unwinding musical information at a high level of detail and resolution, yet manages the magical-musical trick of never sounding sterile. The combination of the LA4 preamp and AHB2 amp serves up music with a transparently sunny disposition. But don’t be fooled. The Benchmarks have teeth, and when called upon, the pair goes deep, with an effortless slam that belies their small size. The AHB2 is a very fast amp. The LA4 had no trouble providing a signal fast enough to show off the AHB2’s speedy nature. The sound stage is excellent: depth, width, height, and the illusion of a performance space were fantastic. I really, really, really enjoyed the Benchmark duo’s high level of detail, layering of instruments and voices, deep bass, and fast, furious dynamic swings. The AHB2 gets special treatment here, not because it is a Benchmark product, but because, in my opinion, it should be considered no less than a companion piece to the LA4. It is the fastest pairing of the three amps I used. It is also the quietest, and arguably, cleanest. That however, is not in any way, meant to say the LA4 preamp can only be used to drive its like-sized sibling. Quite the opposite in fact. All of the amplifiers I drove with the LA4 had pronounced differences in sound, and the LA4 handled them all with aplomb. The Firstwatt F7: Once the SPL hit my listening room’s sweet spot, the LA4/F7 drove the VR-35s terrifically well. The F7 is unbalanced, so this was an opportunity to listen at length to the LA4’s unbalanced RCA output. Honestly, after the first few minutes, I never thought about it again. It sounded excellent. The Benchmark preamp did a fantastic job letting the F7’s wonderful inner-resolution, beautiful timbre, and well controlled bass to come through loud and clear. The Pass Labs XA30.8: The LA4 and my reference XA 30.8 are a formidable pairing. There is a sneaky, powerful finesse about the two. 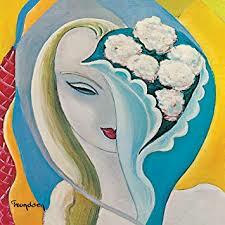 Imagine a smooth, musical stone suddenly falling from the sky, and whomping you over the head. Think James Taylor meets the Ramones. The LA4 once again showed its exceptional abilities to create an enveloping sound stage. The LA4/XA 30.8 is sonically weightier, and imaging denser, than the other two amps. Transient speed is less apparent than compared to the Benchmark amp, but staging, bass slam, and dynamic power are definitely on display through the LA4. Garbage in, garbage out. The LA4 allows the veracity of every recording to be heard. It is also the common ground which allows sonic differences between amplifiers to shine through. The beautiful timbres and textures of the F7. The smoothly powerful, masterfully coherent, XA 30.8. And the hi-resolution speed demon AHB2, with its crystalline highs, clean midrange, and dynamic slam. To be able to clearly hear these differences is a testament to the LA4 preamp’s ability to remain neutral in the audio chain. 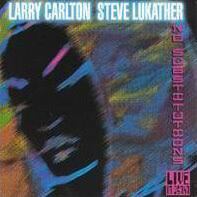 I really enjoy Larry Carlton and Steve Lukather’s No Substitutions: Live in Osaka CD. This recording creates a nice feeling of being in a smoky, Japanese nightclub; cocktail glasses clinking amid the chatter and applause The LA4/AHB2 does an excellent job recreating the sense of being in the crowd, listening to these guitar masters. It also highlights differences between the duo’s different guitar rigs, and playing styles. 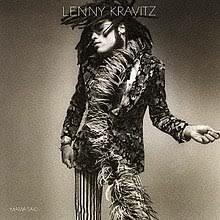 The Lenny Kravitz retro-Motown inspired ballad “It Ain’t Over Till it’s Over” from 1991’s Mama Said CD, seemed to envelope the room with music. Whether the recording uses Q-Sound or not is unclear, but the Benchmark audio pairing of LA4 and AHB2 sure made it sound so. 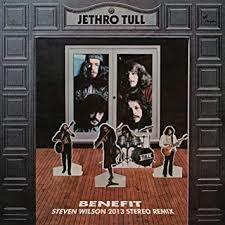 Jethro Tull’s “For Michael Collins, Jeffery, and Me” from Steven Wilson’s 2013 mix of Benefit. Emotive, textured, rich, and dynamic through the LA4 and Firstwatt F7. I love this recording, and it was the best I ever remember hearing it. 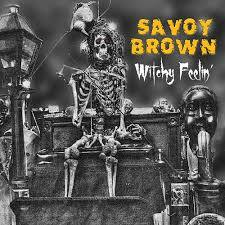 Listening to the stripped down blues of “Witchy Feelin’,” from Savoy Brown’s 2017 release of the same name; I noted excellent clarity of both instruments and vocals. Players were the correct height, believably staged, and surrounded by reverberations from the recording space. As Kim Simmonds’ guitar trailed off into oblivion, it became clear what needed to be said: the Benchmark LA4 is an an excellent preamp, an operationally solid spec-monster that also happens to sound great. It is an audio component I could own. 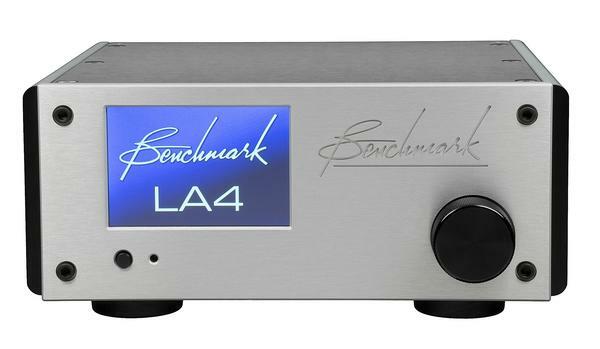 The Benchmark LA4 Line Amplifier is a solid, high-quality audio component. Every change I made to my system—whether equipment or musical selections—could be heard. Horses for courses, of course, but given the LA4’s affordable price, if you think you can handle the truth (thanks Jack Nicholson!) you must give it a listen. A 30 day Risk-Free trial period is available. Retail: $2495 USD MSRP (Available in Black or Silver) or $2595 USD MSRP with optional Remote.